Following an outstanding college career capped by winning the 1968 Heisman Trophy, the highly-coveted Simpson was drafted by the Bills with the first overall pick in the combined AFL/NFL draft. His pro career started slowly, as he was used sparingly and missed time due to injury during his first three seasons, never carrying more than 182 times or gaining more than 742 yards. However, the return to Buffalo of Head Coach Lou Saban in 1972 marked a change as Simpson became the centerpiece of the offense and led the NFL in rushing with 1251 yards, earning 1st-team All-Pro and Pro Bowl honors. He followed that up in 1973 by shattering the single-season rushing record with 2003 yards and gaining consensus MVP honors. While his rushing total dropped to 1125 yards in ’74, Simpson still received consensus 1st-team All-NFL and Pro Bowl honors for the third straight year and the Bills reached the postseason. Bills went 8-6 to finish third in the AFC East while leading the NFL in total offense (5467 yards), rushing yards (2974), scoring (420 points), and touchdowns (57). 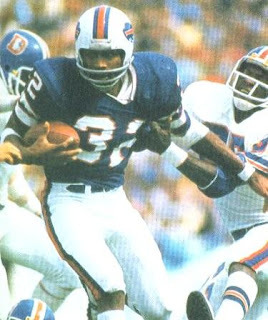 Simpson led the NFL in rushing for the fourth time in five years in 1976 with 1503 yards and received All-NFL and Pro Bowl recognition for the fifth and last time (he had also been chosen to one AFL All-Star Game). Injuries in 1977 limited him to seven games and he was dealt to the 49ers, where he spent his last two seasons (1978 and ’79). Upon retirement, he had gained 11,236 rushing yards, the second-highest total up to that time. Simpson was inducted into the Pro Football Hall of Fame, Class of 1985.